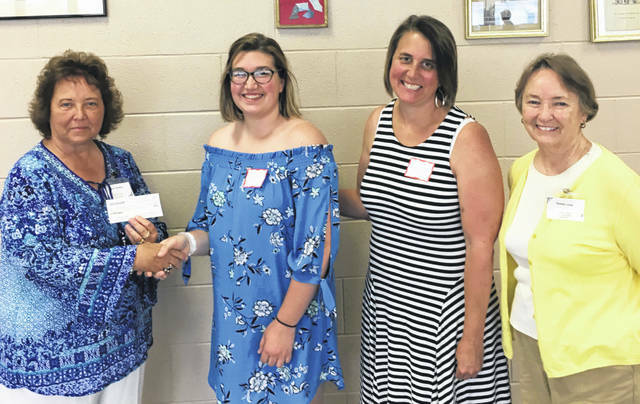 Abigail Sever, a 2018 Washington High School graduate, recently received the Fayette County Retired Teachers annual scholarship. She will attend Bowling Green University and will major in education and music. From left to right are Susan Stuckey, FCRT president; Abigail Sever; Susan Sever (Abigail’s mother); and Bobbi Long, scholarship chair for FCRT. https://www.recordherald.com/wp-content/uploads/sites/27/2018/07/web1_FCRT-scholarship-pic.jpgAbigail Sever, a 2018 Washington High School graduate, recently received the Fayette County Retired Teachers annual scholarship. She will attend Bowling Green University and will major in education and music. From left to right are Susan Stuckey, FCRT president; Abigail Sever; Susan Sever (Abigail’s mother); and Bobbi Long, scholarship chair for FCRT.